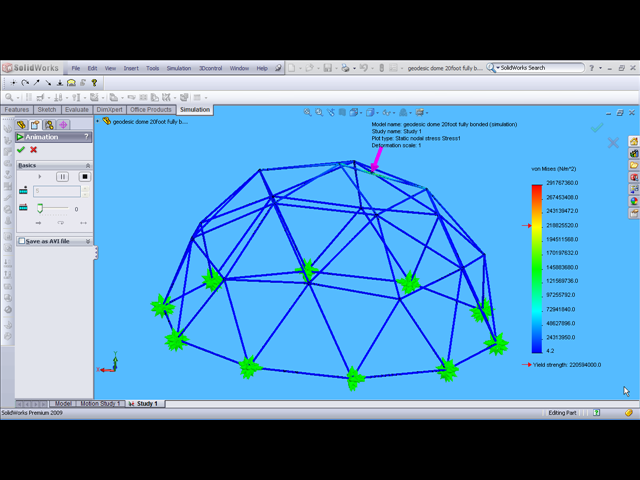 This work shows a CAD exploration I did on 2V geodesic domes. I created a parametric solid model in SolidWorks such that everything would scale in a desirable and predictable way based on a single imput (the diameter of the dome). Originally, I had built two domes with a group of friends in 2005-2006. We used discarded 2x4s, and lashed the corners together with rope. This CAD work that I did after that was more an FEA exploration of geodesic dome strength under ideal conditions.